The property was the seat of Rhys Lloyd in 1550. This may have been the home of William David Lloyd  and John Lloyd [1596 and 1611] Rhys Lloyd’s granddaughter, Catherine, married John Bryune, later of Bronwydd. Plas Llangoedmor remained in the hands of his descendants until Jacobean times. 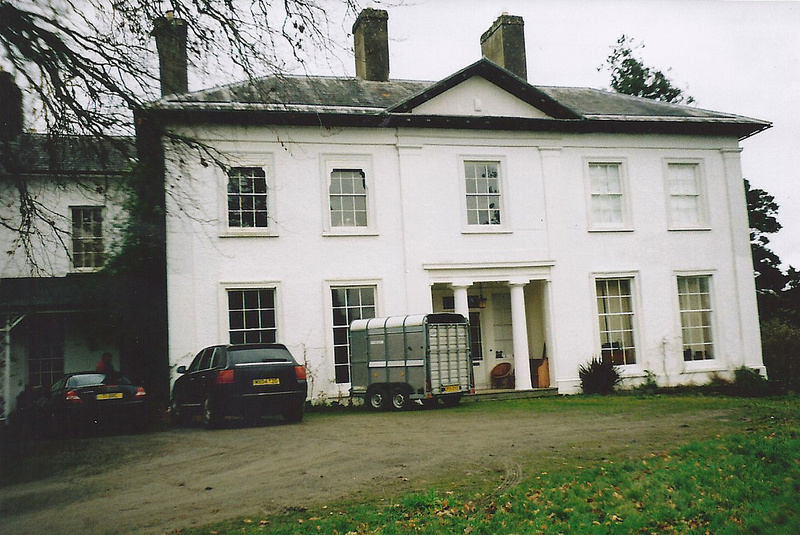 On 7th March 1670 Plas Llangoedmor was included in the marriage settlement of Richard Lloyd, son and heir of Erasmus Lloyd of Ystrad Teilo, and Elizabeth Lloyd, daughter of David Lloyd. In 1728 the Plas still belonged to the Lloyd family of Maws and Ystrad Teilo, and that year, it was mortgaged to Catherine Mansell, widow. In 1738 Richard Lloyd assigned it to Edward Mansell of Trimsaran. 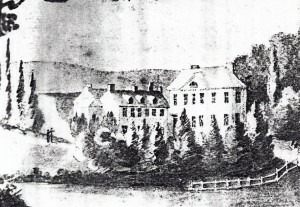 Plas Llangoedmor was still held by the Lloyd family in 1741. In 1757 the mortgage was assigned to Richard Knight of Ludlow. Mr. Owen of Rhiwsaeson had previously tenanted the property, though he was rarely there. Lloyd had the house redesigned and extended in 1758-60. He retained an Elizabethan wing. On 13th September 1783 the Plas was due to be sold by auction, including “…a good modern built MANSION HOUSE…” held at that time by James Green, paying a yearly rent of £6 6s. Plas Llangoedmor was sold on 20th February 1786 for £1600 to David Edward Lewis Lloyd of Dolhaidd until 1801. In 1787 David Edward Lewis Lloyd became the Mayor of Cardigan. On 2nd June 1801 the Plas was leased to Benjamin Millingchamp of Cardigan, who later acquired it for £3500 and the furniture for a further £200. Reference was made to “…the new part of the said mansion house…” that year. Benjamin Millinghamp was the second son of Joseph Millingchamp, Controller of Customs at the Custom House, Cardigan, by his wife, Anne Millingchamp nee’ Gambold. Born in 1756, he married Sarah Rawlinson in 1798. He had been the Rector of Rushall, Wiltshire, and was once Chaplain of Fort St. George, Madras, and a senior Chaplain in the Royal Navy. 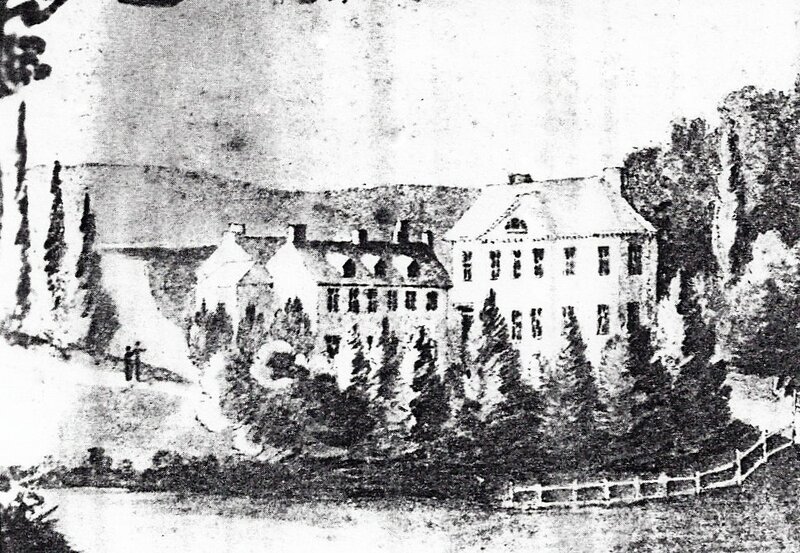 A drawing was made of the house at that time by Sarah Milingchamp. On 3rd June 1801 David Edward Lewis Lloyd of Dolhaidd released the Plas to Rev. Benjamin Millingchamp of Cardigan. In 1801-29 Rev. Benjamin Millingchamp. In 1801-69 Sarah Milingchamp lived here. In 1821 Rev. Benjamin Millingchamp became a Doctor of Divinity of Oxford and was appointed Archdeacon of Carmarthen in 1825. A Persian scholar, he brought many rare and valuable manuscripts to the Plas. On 26th April 1826 a marriage settlement was drawn up for the impending wedding of Sarah Milingchamp of the Plas, daughter of Rev. Benjamin Millingchamp, to Captain Herbert Vaughan of Blaenporth. Rev. Benjamin Millingchamp died on 6th January 1829 at the age of 73, and was buried at Llangoedmor Church on 12th January 1829, leaving an £8000 estate to his son-in-law, Col. Herbert Vaughan, formerly of Brynog. He also left a daughter and a widow, both named Sarah. In 1829-61 Captain Herbert Vaughan lived here. In 1829-85 Sarah Vaughan (nee’ Millingchamp) lived here. In February 1829 a son, Herbert Vaughan, was born here to Sarah & Herbert Vaughan. John Vaughan was born here in December 1830 – the second child of Herbert & Sarah Vaughan. John Vaughan lived here in 1830-81. In 1830 Colonel Herbert Vaughan had an old range at the Plas demolished. The 1838 tithe map shows a range of buildings here since demolished. By 31st June 1840 Herbert Vaughan had acquired Canllefaes. In 1841-64 Mary Rawlinson and Albinia Rawlinson – sisters of Sarah Millingchamp, lived here. In 1841 the following persons lived here: Sarah Millingchamp, 60, widow, independent; Mary Rawlinson, 65, her sister; Albinia Rawlinson, 60, sister; Herbert Vaughan, 40, son-in-law, in army; Sarah Vaughan, 35, daughter; Edward Vaughan, 8, grandson; servants – Margaret James, 35; Ann Everett, 17; Elizabeth Rogers; Rachel Bowen, 15; Martha Bowen, 15; and William Pritchard, 20. In 1843 Herbert Vaughan was the chairman of the local turnpike trust. Herbert & Sarah Vaughan had four children. In 1851 the following persons lived here: Sarah Millingchamp Vaughan, 77, widow; Sarah Vaughan, 59, her daughter, Edward Percival Vaughan, 18, her grandson; Mary Rawlinson, 83, sister; Albinia Ann Rawlinson, 79, sister; John James, 21, footman; Charlotte Harris, 32, cook; Margaret Doughton, 18, needlewoman; Mary Jones, 36, housemaid; Elizabeth Edwards, 27, dairy maid; Mary Jones, 16, kitchen maid; and Daniel Thomas, 55, farm labourer. In 1855 Col. Herbert Vaughan junior, son of Col. Herbert Vaughan, died aged 27 of wounds received in the Crimea. He was Captain of the 90th Perthshire Light Infantry, which his father had been Colonel of. Lieutenant-Colonel Herbert Vaughan attended the meeting of the Cambrian Archaeological Association at Cardigan on 15th August 1859. The following persons lived here in 1861: Sarah Millingchamp, 87; Herbert Vaughan, son-in-law, 67; Sarah Vaughan, daughter, 61; John Vaughan, 30, grandson; Mary Rawlinson, 92, sister; Albinia Ann Rawlinson, 90, sister; and five servants – Elizabeth Adams, 30, cook; Elizabeth Morgan, 29, lady’s maid; Martha Peters, 21, house maid; Sarah Lewis, 36, dairy maid; and Catherine Evans, 22, kitchen maid. In November 1862 Colonel Herbert Vaughan died aged 75. In 1863 Thomas Harman Brenchley of Glaneirw, then living at Plas Pantsaeson, Monington, married Emily Sarah Vaughan, eldest daughter of the late Herbert Vaughan. Edward Percival Vaughan, third child of Herbert & Sarah Vaughan, died of cholera in Bombay. On 26th June 1863 Saarah Vaughan, widow of Lt. Col. Herbert Vaughan of the Plas, gave Crugmore near Cardigan to John Vaughan. On 10th August 1864 Albinia Ann Rawlinson died here aged 95. On 10th December 1864 her sister Mary Rawlinson died aged 96. On 24th March 1865 probate was made of the wills of Albinia Ann and Mary Rawlinson. On 20th February 1869 Mrs. Sarah Millingchamp died aged 95. On 12th August 1869 John Vaughan married Julia Anne Morris – daughter of Thomas Charles Morris of Bryn Myrddin and Cwm, Llansteffan. In 1869-1922 Julia Anne Vaughan lived here. They had five children – Herbert Millingchap Vaughan, John Percival Vaughan, Edward Vaughan, Julian Vaughan and Charles Vaughan. Herbert Millingchamp Vaughan was born here on 27th July 1870 – the son of John & Julia Ann Vaughan. In 1870-1923 Herbert Vaughan lived here. In 1871 the following persons lived here: Sarah Vaughan, 71, widow; William Evans, 46, butler; Lillie Morris, 27, cook; Mary Christopher, 21, lady’s maid; Eliza H. Jenkins, 24, house maid; Jane Nicholas, 22, dairy maid; and Ellen Thomas, 15, kitchen maid. On 27th December 1877 Hannah Maria, eldest surviving daughter of William Evans of the Plas, married John Prosser of Haverfordwest. In 1881 John Vaughan, youngest son of Herbert & Sarah Vaughan, died aged 51. He left a widow, Julia Ann Vaughan, and five children. In 1881 the following persons lived here: Sarah Vaughan, 81; Herbert Vaughan, 50, her nephew; Sarah Thomas, 54, cook & housekeeper; Lewis Jones, 14, groom; Phoebe Davies, 26, dairymaid; Mary A. Evans, 17, kitchen maid; William Evans, 56, butler; Mary A. Hughes, 21, housemaid; and Mary Christopher, 28, lady’s maid. On 21st March 1885 Sarah Vaughan, widow of Col. Herbert Vaughan, died aged 85. In 1891 the following persons lived here: Julia Ann Vaughan, 47, widow; John Percival Vaughan, 18, her son, civil servant; Herbert Millingchamp Vaughan, 16, son; Hannah Thomas, 31, cook; Emma Pepper, 27, parlour maid; Annie Rees, 21, house maid; and Mary Anne Powell, 19, dairy maid. In 1901 the following persons lived here: Julia Anne Vaughan, 57 (b. Carmarthen, English-speaking); Rachel Davies, 27, house-maid (b. Llandygwydd); Elizabeth Watts, 25, cook (b. Cilgerran); Frances Lloyd, 23, parlour maid (b. Llangoedmor); and Elizabeth Michael, 17, kitchen maid (b. Solva). The household was bilingual. In 1904 Herbert M. Vaughan gave a talk in Cardigan on the architecture and history of St. Mary’s’s Church, Cardigan. John Percival Vaughan, brother to H. M. Vaughan, died in India in 1906. On 19th November 1907 Julian Wilmot Morris Vaughan of Plas Llangoedmor, 33, married Mary Catherine Roch, 28, of Plasybridell, Bridell, daughter of William Frances Roch. In 1912 H. M. Vaughan and Charles Gwynne Vaughan lived here. In 1914 H. M. Vaughan was a Cardiganshire Magistrate. On 12th October 1914 Herbert Millingchamp Vaughan addressed a recruitment meeting at the Pavilion, Cardigan. In 1914 H. M. Vaughan, Mrs. Julia Ann Vaughan and Charles Gwynne Vaughan lived here. On 3rd March 1916 H. M. Vaughan became the Sheriff of Cardiganshire. On 4th May 1917 Captain Edward H. Vaughan, 3rd son of Mrs. Julia Ann Vaughan of Plas Llangoedmor, was wounded on the Balkan front. In February 1919 Charles Gwynne Vaughan, youngest son of Mrs. Julia Ann Vaughan, returned home from the War. On 13th October 1922 Mrs. Julia Ann Vaughan died aged 78. By 9th July 1923 Herbert Millingchamp Vaughan had sold Plas Llangoedmor to David Griffith Berrington Davies of Castle Green (Cardigan Castle), and moved to Tenby. From 18-21st March 1924 there was a clear-out sale here for H. M. Vaughan. William Phillips, former Head Gardener at Castle Green, became the Head Gardener here. In 1924-54 David Berrington Griffith Davies (he usually transposed the two middle names), J. P., lived here. In 1925 He was President of Cardigan Agricultural Show. Mrs. D. B. G. Davies died on 19th January 1930 after a long illness. A memorial window in her honour was unveiled at Llangoedmor Church in 1932. On 13th October 1930 David G. Berrington Davies Davies’ brother, Thomas Bowen Davies, died suddenly in South Africa. In 1934-35 David B. G. Davies was the chairman of Cardigan Golf Club. On 15th July 1935 David Berrington Griffith Davies married Miss Evelyn Alderson of Newport. On 19th June 1936 a son was born to Evelyn and David B. G. Davies. On 19th August 1936 Mrs. Berrington Davies opened the new clubhouse of Cardigan Golf Club at Gwbert. On 6th October 1936 David G. Berrington Davies opened the new Cardigan Courthouse. In April 1941 David G. B. Davies, J. P., was re-appointed president of the Cardigan Nursing Association. In 1943 William Phillips retired after 60 years as gardener to the family, at the age of 87. David G. Berrington Davies died in October 1954. In 1954-61 Mrs. Berrington Davies lived here. In 1955 F. J. H. Corbyn, O. B. E., also lived here. On 4th February 1955 Plas Llangoedmor was advertised for sale with 4 acres. On 27th and 28th November 1957 a sale of effects was held here. In October 1959 Mrs. Berrington Davies of Plas Llangoedmor donated a private communion set to Llangoedmor Church in memory of her late husband. On 10th June 1961 there was a sale of effects here. The Berrington Davies’ sold the property to two brothers named Birt, who removed a fireplace and conducted some small alterations. The house became a listed building in 1964. They sold the property to Mrs. Cuff. In July 1979 the 14 bedroom property was advertised for sale and it was sold the following year. The 10 bedroom property was advertised for sale in December 2003 and again in July 2007 and in 2012.
overlight. E side has similar two-window range, the n E end of c1760 range projects with canted roughcast (red brick beneath) two-storey bay, cyma-moulded eaves brackets and hipped roof. 12-pane sashes, longer below. Rear has similar eaves, two side wall stacks, one truncated, arched stair-light and 12-pane sashes. To right, added service range has shallow gable to left with tripartite lunette. Front of SERVICE RANGE is set back with low-pitched deep-eaved roof and rendered ridge stack. Recessed section to right, whitewashed rubble stone. 15-pane sash and 6-panel door with overlight under lead swept-roof verandah with ornamental trellis piers each side (plans show a centre pier also). One central 12-pane sash above. To left projecting roughcast section has 12-pane horned sash each floor and hipped roof. INTERIOR – Front range of circa 1833 has broad hall and room each side, 6-panel doors and panelled shutters. Left library is altered, right drawing-room has fine Greek Revival white marble fireplace with columns, lion-masks and acanthus frieze. Acanthus cornice, and similar friezes over two doors. Rear 1760 range has centre dog-leg stair in four flights with turned balusters and scrolled tread-ends. Thick ramped rail. Large dining-room to right has painted wood panelling in large panels, dado rail and moulded cornice; a plain fireplace replaces a very ornate fireplace and overmantel now removed to St. Fagan’s Museum. Fielded panelled doors, two at N end with architraves and pediments on pulvinated friezes. A panel between the doors is enriched with corner square rosettes and simplified scrolled pediment. Square-headed serving recess on W wall with similar detail. An exceptionally well-composed remodelling of a small country house, which retains its interiors. OUTBUILDING TO REAR – Earlier to mid C19 range of outbuildings, whitewashed rubble stone and imitation slate roofs, single storey and loft, l-plan. Cut-stone voussoirs to openings. At N end a short gabled return with broad arch in angle and 9-pane window to left. Main range faces W and has ground floor window, window, door, taller door with overlight, window, and door. Two first floor 6-pane casements with stone voussoir heads. One window in S end ground floor. Set back S end range with big stone outside steps across W front, with arch under giving access to ground floor store. First floor has window, door, and door onto outside-stair landing, the window with horizontally-sliding casements, and all with timber lintels. Brick S end stack. N end room has big fireplace, recess for copper to one side and bread oven to other. PRIVY _ C19 privy, rubble stone, rendered to front with imitation slate pyramid roof and rear outshut. 6-panel door to W front, 9-pane window to S side. Timber lintels. WALLED GARDEN – Later C18 walls to walled garden, rubble stone with rough stone coping, enclosing l-plan garden. Walls are high on three sides but ramped down at SW angle to become terrace wall along N side of house. Doorway in W wall with stone voussoirs and 6-panel door. Outbuildings, not included in list, are built against outside N wall and gabled stone building faces into garden from E side. Marked on 1838-40 Tithe Map, but probably not including E part of enclosure, and shown in pre-1833 watercolour of house before front range was added. NLW Morgan & Richardson MSs 1457-1458; 1472; 1437; 1469; 1518; 1528; 1532; 1561; 1571. Sale Particulars – Plas Llangoedmor, West Wales Properties, 2007. We corresponded some years ago about my family and Plas Llangoedmor – I don’t remember the content in detail. I’ve just been discovering your work on Castle Green and Plas, and I’m quite bowled over by your industry and detective work. There’s a vast amount there of which I had no notion. Have you seen H M Vaughan’s “The South Wales Squires” (1926)? I gave a poor copy to a bookshop and they’ve still got it listed online (“Fair to good. No Jacket. First Edition. Boards scuffed, water stain on top back, corners worn. Spine present but detached. Hinges v good. 216 pages, publisher’s catalogue, frontispiece and 7 other photographs. Contents foxed and some water staining, esp. top edges of end papers. Ff end papers signed by original (squire) owner & wife and stamped with their address. First edition”). It’s stamped with a Plas stamp and I think signed as owner by my father. If you want it I’ll get it for you. What became of Donald Davies, who wrote for the Tivyside – I guess he must have died by now? He had a photo album of mine with some pictures of Plas – I never made any provision for getting it back and I don’t think it was marked as mine in any way. I hope some of his papers may have come your way. I noticed your mention of the Birts selling a fireplace. It was carved wood (my father used to wish he could find Grinling Gibbons’ initials in there somewhere) with the top framing a copy of a Claud Lorrain port scene (embarkation of St Teresa or some such), reputedly brought from London on pack animals. The Birts sold it to St Fagans museum, where it was briefly on display, but confined to store last time I went. I believe it was replaced by a redbrick fireplace in the dining room. I believe that we met last week, at Penbontbren, and I have been thinking over what you said about the Berrington connection in Abergavenny. I have now remembered where I have heard the name; the Berringtons owned and lived at Pant-y-goitre, a large Georgian house just outside Abergavenny, in the parish of Llanfair Kilgeddin. Incidentally, it’s also for sale at the moment. I don’t know where the Berringtons originated but some of them had Davies as a middle name so I wonder if they are connected to your family by marriage. Did you have any luck tracing Pam Lloyd? I believe that she married a Mr Smith and moved to the USA, and that she has a daughter named Amanda, who has contributed to this site, on the page for Coedmore. I left a message for Amanda with my contact details but she did not get in touch with me. I had hoped that she and her mother might be interested in the book that I’ve written, ‘The Longcrofts: 500 Years of a British Family’, which includes a chapter on the Lloyds of Coedmore. Are you back home in France now? About the Plas Llangoedmore, I just wanted to share this with you. This is immediately followed by her recipe for Curry and how to obtain the ingredients! Thank you Amy for your post of 2 March. I have always wondered why the Millingchamps of the Plas Llangoedmore were on such close terms with my Hassall ancestors at Cilrhue Boncath. I knew that Mary Hassall née Harries had an aunt (sister of her father John) Elizabeth, who married a George Gambold (1718 – 1755). What I didn’t know was that Rev Ben Millingchamp’s mother Anne was also a Gambold. Many thanks!